1. New Jersey music obsessions include Bon Jovi. 2. It's Guido central. See "My New Haircut." 3. There is a disproportionate amount of Georgetown students from New Jersey. 4. New York is better. And the list goes on. Still, the allure of a break from DC life was stronger than my half-joking prejudices. Being far from home and family, I am easily won over by any situation involving a.) family togetherness or b.) motherly love, so spending time with not one but TWO Italian families was a micro paradise. I was showered with love and attention from heavily accented and heavily tanned women while their own children, my friends, looked on. Is it strange that this is part of what made my vacation great? 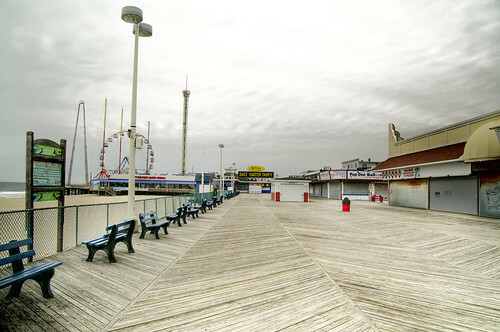 The nearby Seaside Heights boardwalk was a scene straight from the 1980s. The signs, the colors, and sometimes even the fashion. Everyone, young and old, had tattoos. And more importantly, everyone had a pack of cigarettes next to their SPF 4 sun tan lotion. I had my SPF 50 ready to go. I'm back from Jersey now with a new appreciation for the so-called Armpit of America. "When in Rome, do as the Romans do." I didn't get a tattoo, but I got a decent tan, smoked a cigar, and hung out with Italian Americans. That's a great vacation, even if it was only a weekend.